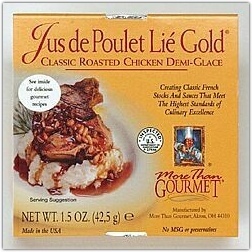 More Than Gourmet Jus de Poulet Lie Gold/Classic Roasted Chicken Demi-Glace - A true classic chicken stock, bound with starch, complements the Glace de Poulet Gold & allows you to make all the classic, lighter colored, chicken-based sauces without the added time & effort typically required to bind a roux into the finished sauce. It also has a more dominant chicken flavor & light golden color. Now you can make all the classics quickly & easily. Poulet Lie Gold is perfect for enhancing soups, binding a variety of fresh sauces, & is the complete beginning for finishing sauce for turkey pork & chicken dishes. The 1.5 oz. container makes approximately 1 cup.